Paul's Letter to the Galatians points to the influence of his missionary attempts in Galatia. By reconstructing the missionary journeys of Paul and his company in Asia Minor the author argues once again for the south Galatian hypothesis, according to which the apostle travelled through the south of the province of Galatia, i.e. southern Pisidia and Lycaonia, and never entered the region of Galatia proper in the north of the province. Supporting material comes from the epigraphic evidence of the apostle's name in the first four centuries. Nowhere else in the world of early Christianity the name Παύλος was used with such a high frequency as in those regions where the apostle founded the first congregations in the south of the province Galatia and in the Phrygian-Galatian borderland. Keywords: : Paul's missionary journeys; North/South Galatian hypothesis, Epigraphical evidence: Name "Paul"
Trefwoorde: Paulus se sendingreise, Noord-/Suid-Galatehipotese, Epigrafiese Getuienis: Naam "Paulus"
Even though Barnabas and Paul were sent by the church of Antioch on the Orontes to the province Syria-Cilicia to spread the gospel on Cyprus and they then went to Asia Minor,1 it was only Paul who revisited Lycaonia (cf. Acts 16:1-5; 18:23). The epigraphical material referred to here, will illustrate that more than anyone else, Paul left his mark on Lycaonian Christianity.2 From the scant evidence available, it is clear that the Pauline letters and the First Letter to Timothy had an impact on the region. The question of the influence of Paul's Letter to the Galatians is more complex. Since the evidence of the superscription, the praescriptio and Galatians 3:1 is thus inconclusive, a solution of the problem cannot be found without attending to the information the Acts of the Apostles gives on Paul's visits to eastern Pisidia, Lycaonia, Phrygia and Galatia. Initially Barnabas and Paul were sent by the church in Antioch on the Orontes to proclaim the word on Cyprus. Since Barnabas was a Jew from Cyprus, they would have known how to plan the journey. In Paphos on Cyprus, as the author of Acts tells us in Acts 13:6-12, he met Sergius Paul (l) us, called in Greek ό νθύπατος, which is a usual translation for the Latin proconsul (Mason 1974: s.v. and p. 106). The text of Acts 13:7 probably refers to Lucius Sergius Paullus22 and not to a Q(uintus) Ser[gius Paullus] who might be a construct of modern epigraphy.23 The Sergii Paulii were citizens of the colony in Antioch on the Pisidian border and landowners near modern Sinanli in the region of Vetissus on the border between the Galatian Ancyra and Laodicea Combusta in western Lycaonia (Mitchell 1993:1:151-52). It is most probable that the connections between Sergius Paul(l)us in Paphos and the ruling class in Antioch influenced Paul and Barnabas' decision to go there and that it facilitated their journey (See also Mitchell 1993:2:6-7; Breytenbach 1996:42-43). Paul's Roman citizenship might also have played a role, since he seems to have had a preference for Roman military colonies (Breytenbach & Zimmermann, forthcoming). Not only did he start his proclamation of the gospel to the gentiles in the colonies connected by the eastern branch of via Sebaste (Antioch, Iconium and Lystra). On his second missionary journey he also moved to the colony at Alexandria on the Troad (Hemer 1975), which he visited at least three times (Acts 16:8; 2 Cor. 2:12; Acts 20:1, 6-12). He often travelled via this port to Philippi and then to Corinth (Acts 16:11-12; 18:1, then 2 Cor. 2:12 and 7:5, and again Acts 20:1-6), both being Roman colonies. It was in Corinth that he planned to reach the colony at Tarraco on the east coast of the Iberian Peninsula with the help of the Christians in Rome (Rom. 15:22, 28; 16:1, 23). Once Barnabas and Paul had left Paphos on Cyprus and reached the Roman controlled harbour in Perge in Pamphylia (Acts 13:13), the southern branch of via Sebaste could have enabled these first Christian missionaries to circumvent the insurmountable western Taurus. For their initial journey to the colony at Antioch though, the author merely mentions they passed on from Perge and arrived in the Pisidian Antioch (Acts 13:14). When they returned from Antioch through Pisidia to Attaleia (Acts 14:24-25), they could have taken the western branch of the via Sebaste through the Roman colony at Comama. Since it is stated however, that they "travelled through" Pisidia (διελθόντες τ ν Πισιδίαν; cf. Danker 2000: s.v. διέρχοµαι) back to Perge in Pamphylia (Acts 14:21, 24), they might rather have used the road skirting the southern edge of Lake Coralis (Mitchell 1993:1:78-80). The author states that they spoke the word in Perge, not implying that they proclaimed the gospel whilst travelling through the Pisidian Mountains. Since the original foundation of the city Antioch on the Pisidian border in the 3rd century B.C.E. a Jewish community might have lived there.24 They must have survived the foundation of the Roman colony by Augustus in 25 B.C.E., for in Acts 13:14b-43 the author of Acts placed the speech of Paul on the Sabbath in the synagogue in Antioch. He follows his normal narrative pattern: Paul has considerable success and the local Jews stir opposition. Nevertheless, the narrative claims in Acts 13:49 that the Christian message spread through the whole territory of Antioch (διεφέρετο δ ό λόγος το υρίου δι' λ ς της χώρας).25 In the city's territory, the "word" was first spread in Asia Minor in a rural area. This was an area in which the local population had been Hellenized since the foundation of the Greek city. When the Augustan colony was founded, deducted veterans were settled on the territory and the legio VII Claudia was stationed here for quite a while (Breytenbach & Zimmermann, forthcoming). Such factors increased the cosmopolitan nature of the city and its territory. It was thus possible for Barnabas and Paul to use Greek to communicate with the rural population. According to Acts 13:50, the local Jews in Antioch incited the "pious women of repute and the first men of the city" (τ ς σεβοµένας γυνα ας τ ς εύσχήµονας αι το ς πρώτους τῆς πόλεως). It is crucial to look carefully at the terminology used here. The πρώτοι της πόλεως formed the group from which the duoviri governing the Roman colony came.26 The expression εύσχήµοναι most probably refers to women of nobility (Spicq 1994: s.v.) and translates the Latin honestae (Mason 1974: s.v). The members of the ruling class in Antioch thus expelled Barnabas and Paul from their territory (έ έβαλον αύτοὺς άπὸ τῶν ὁρίων αὐτῶν),27 i.e. the territorium of the Antiochia colonia Caesarea. This definitely made it difficult for Paul and Barnabas to return to the city itself, but it would have been easier to return to the villages on the territory of the colony. Expelled from the territory of Antioch they took the via Sebaste eastwards through the mountains to Lycaonia to establish Christian congregations in the neighbouring Roman colonies in Iconium and Lystra (Acts 13:51; 14:1, 6). It is notable that, according to Acts 14:6, they did not go to the cities only, but also to the περίχωρος, the area around these two cities. The territories of Iconium and Lystra shared a common border.28 Again Paul and Barnabas planted the seeds of Christianity in a rural area. Again this is an area where Augustus settled veterans when the colony was founded (Breytenbach & Zimmermann, forthcoming). According to the narrative of Acts, the Jews forced Paul and Barnabas to flee from Iconium to Lystra and then further on to Derbe (Acts 14:5-6, 19-20). As the crow flies, ancient Derbe is located ca. 100 kilometres east-southeast of Lystra. In this rather small city on the route from Iconium and Lystra to the Cilician Gates (Ballance 1957:147-51), Barnabas and Paul preached the gospel and caused a relatively large number to become disciples. Hereafter they returned to Lystra, Iconium and Antioch (Acts 14:21-22). Acts 14:23 explicitly states that they appointed elders in every congregation: "with prayer and fasting they entrusted them to (the protection of) the Lord in whom they had come to believe." After the meeting of the apostles in Jerusalem (Gal. 2:1-10; Acts 15), Paul and Silas left Antioch on the Orontes for the apostle's so called second missionary journey (Acts 15:40). From the parallel journey of Barnabas and John Mark to Cyprus, it is clear that the congregation in Antioch on the Orontes planned to strengthen the newly founded congregations and to inform the presbyters on the decisions of the meeting of the apostles. Acts 16:1 tells us that Paul came to Derbe and Lystra, visiting Derbe for a second and Lystra for a third time. In Lystra, Timothy joined Paul and Silas (Acts 16:1-2). Acts 16:4 implies that Paul also went through Iconium for a third time. Even if the remark in Acts 16:5 that the numbers of the churches increased daily may just fit in with Luke's narrative strategy, it is reasonable to accept that Paul's visit strengthened the faith of the believers. The impression that the author of Acts leaves, is that there were thriving congregations in Derbe, Lystra, and Iconium. This time Antioch on the Pisidian border is not mentioned or implied. Turning to Acts 16:6 it is clear that Paul and his co-workers planned to go to into the Province of Asia.29 As the author of Acts expresses it, they were "hindered by the Holy Spirit". It is necessary to analyse this remark in more detail: Διῆλθον δὲ τὴν ρυγίαν αι γαλατικὴν χώραν ωλυθέντες ὑπὸ τοῦ ἁγίου πνεύµατος λαλῆσαι τὸν λόγον έν τῆἈσίᾳ (Acts 16:6). The first part refers to the route Paul, Silas and Timothy actually took. Both φρυγίαν and γαλατική can be adjectival30 to τὴν χώραν allowing two possible interpretations. Either they went through the Phrygian-Galatian χώρα, or through the Phrygian and through the Galatian χώρα. Interpreting χώραν as meaning "region, land" and respecting the intermediate position of the co-ordinated adjectives,31 the phrase can best be translated with "the Phrygian-Galatian land" and refers to the Phrygian-Galatian borderland beyond the western Sultan Dağlari. It is preferable to let the inherent ambiguity of the text of Acts 16:6 prevail and to accept the coincidence of the actions expressed by the participle and the main verb: "They went through the Phrygian-Galatian region, being hindered by the Holy Spirit to proclaim the word in Asia". The last remark is in line with the narrative concept of the author of Acts. The Holy Spirit preformatted all vital decisions of the church (cf., e.g., Acts 1:2; 13:2, 4; 15:28; 19:21). Firstly, the Galatian conflict on the necessity of circumcising non-Jews when integrating them into the children of Abraham, was most probably located around the via Sebaste (Breytenbach 1996:127-147). The conflict on the circumcision of Timothy that Acts 16:1-5 refer to, was also emerging from tensions caused by the integration of uncircumcised persons into Christianity. It, too, was located in Lystra along the via Sebaste. Given the fact that on his first journey Paul had to flee from Antioch and Iconium due to Jewish intervention (Breytenbach 1996:45-52; Acts 13:50; 14:1-5), in the meantime these conflicts could easily have spilled over to Apollonia with the via Sebaste and westward to Apamea. It is highly probable that the Jewish communities in the neighbouring cities had been warned beforehand and prevented his journey. There might be another reason, too. Since the meeting of the apostles in Jerusalem (Gal. 2:1-10; Acts 15) Paul himself was committed to preach to the uncircumcised. Were he to go down the route to Apamea or westwards to Eumeneia und Acmonia, he would enter the area in central Asia Minor where strong Jewish communities were residing. Important cities along major routes with thriving Jewish communities49 like Apamea on the koine hodos from Ephesus to Tarsus, Eumeneia northwest of the road, and Apollonia on the via Sebaste, show no trace of Christianity in the 1st century, and for the late 2nd and 3rd centuries the influence of the local Jewish communities on the Christians is well attested (Eusebius, Historia ecclesiastica 5.16, 18, 22, 24; Mitchell 1993:2:40-41). Given the location of Apollonia on the via Sebaste west of Antioch and Apamea on the koine hodos between Iconium, Laodicea Combusta, Philomelium in the east and Colossae, Laodicea ad Lycum and Hierapolis in the west, their large Jewish population and the patterns of the expansion of Christianity, it is remarkable that Christian communities emerge here only since the 2nd century. Apollonia and Apamea showed no traces of Christianity in the first hundred and fifty years of its expansion. The obvious explanation is that the Lycus valley was Christianised from Ephesus in the west.50 It is highly probable that because of local Jewish resistance towards the Pauline mission, it was initially impossible to extend the Pauline sphere of influence from Lystra and Iconium westwards along the via Sebaste beyond Antioch to Apollonia and Apamea or along the koine hodos running north of the Boz Dağ and the Sultan Dağlari down to Apamea and eventually Eumeneia. After the meeting of the Apostles, Paul had to change his direction on his so called second missionary journey (Acts 16:6). He did this after the incident concerning the circumcision of Timothy in Lystra (Acts 16:1-5). After travelling north of the Boz Dağ via Laodicea Combusta and along the Sultan Dağlari to Tyriaeum and Philomelium, he went to Troas and then to Macedonia (Acts 16:7-8). Paul might have been forced by Jewish opposition to his gospel to the uncircumcised to change his direction, but he also honoured the agreement of Jerusalem and went to the Macedonians, leaving areas where Jewish communities were known to live to Peter and the others (cf. Gal. 2:9). On his third missionary journey, according to Acts 18:23, Paul, visiting one location after the other ( αθε ῆς; cf. Danker 2000: s.v. ), moved through (διερχόµενος) τὴν γαλατικὴν χώραν αι Φρυγίαν. The last phrase was not translated, because its interpretation is disputed (Breytenbach 1996:114-115). As in Acts 2:10, Φρυγίαν is to be read as a name. The adjective γαλατικήν determines τὴν χώραν as Galatian. Since the expression χώρα denotes either land or an administrative region (praefectura or vicus) (Mason 1974: s.v), it is impossible to determine the exact reference of the expression in Acts 18:23. Paul came from Antioch on the Orontes. He strengthened "all the Christians" (πάντας τοὺς µαθητάς). Since Acts presuppose no other Christian communities in Galatia than those mentioned before in chapters 13-14 and 16:1-5, the most natural assumption is that Paul revisited these communities. Derbe, Lystra and Iconium, all in Lycaonia, were administered as part of the Province of Galatia (Breytenbach 1996:109-112). If one were to take γαλατικὴ χώρα to refer to the province, the phrase would make sense. From here Paul and his company went to Phrygia. Such a reading of Acts 18:23 is enhanced by the interpretation of Acts 16:6 above. Paul and his company then came from Antioch on the Orontes, passing through Derbe, Lystra and Iconium for the third time. This would make a lot of sense, since a local from Lystra, Timothy, was accompanying him. Paul would have passed on the northern side of the Sultan Dağlari, travelling for a second time through Laodicea Combusta, Tyriaeum and Philomelium. Our overview has shown that Barnabas and Paul spread the message of Christianity in Antioch and its territory, in Lycaonia in Iconium, Lystra and surrounding areas, and in Derbe. They stayed longer in Derbe and revisited the three Roman colonies on their way back, appointing presbyters. Later Paul and Silas revisited Derbe, Lystra and Iconium and took the road north of the Sultan Dağlari through Laodicea Combusta, Tyriaeum and Philomelium. On his final journey through the area, Paul travelled again through Derbe, Lystra and Iconium Laodicea Combusta, Tyriaeum and Philomelium. This was his third visit to Derbe and the fourth one to Lystra and Iconium. For a second time he travelled via Laodicia Combusta, Tyriaeum and Philomelium. At all places, he strengthened the disciples. These visits must have had a considerable impact. From the 3rd to the 5th centuries C.E., the name Παῦλος became by far the most used male name in funerary inscriptions from the Lycaonian region.52 Nowhere else in the world of early Christianity the name Παῦλος was used with such a high frequency as in those regions where the apostles Barnabas and Paul founded the first congregations: in the south of the province of Galatia (Iconium and Lystra) and in the Phrygian-Galatian borderland,53 areas which Paul, Silas and Timothy visited again on his second (Acts 16:1-6), and Paul, Timothy and Titus on the third missionary journey (Acts 18:23; 19:1). The name Paul became popular where the apostle Paul exerted influence in the first century. At the 5th century's council of Chalcedon, for instance, Derbe was represented by Paul, the bishop of Derbe (Destephen 2008:772-773). The epigraphical evidence from the first four centuries might be even more proving. 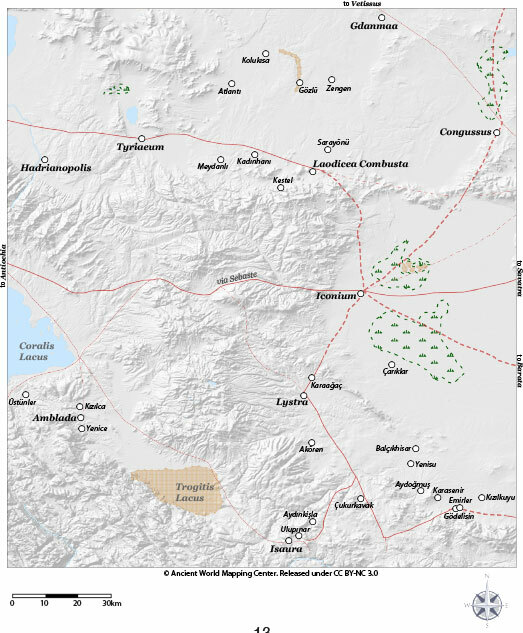 When one maps the locations where the name Paul has been found on inscriptions, with the exception of a late example from Barata, only the south eastern rim and eastern edge of the Lycaonian plain lack evidence (cf. the map below). This Wirkungsgeschichte of the name Paul is best explained by the initial influence of the apostle himself. The evidence weakens the case of the north Galatian hypothesis considerably, according to which Paul and Silas would have gone from Iconium to Galatia proper, and would not have visited Laodicea Combusta, Tyriaeum and Philomelium. Then it becomes more difficult to explain the high frequency of the name Paul. Anyone who would like to argue the case of the north Galatian hypothesis, should take note of the epigraphical evidence, too. It is rather unconvincing to argue that Paul did not have any success in Galatia, because one does not hear of any significant Christian communities in northern Galatia (Galatia proper) until the 4th century. It is fatal to construct the history of primitive Christianity in the 1st century when turning a blind eye to later evidence from the 2nd and the 3rd centuries. I had to confine myself referring to the epigraphical evidence. The literary evidence will enhance these findings. What happened to the Galatian Christians? They have flourished in Lycaonia up until the Arabian conquest. 1 Cf. Acts 13-14. For an historical critical and literary analysis, cf. Breytenbach (1996: Teil B). 2 Cf. Breytenbach and Zimmermann, forthcoming. This essay uses material from this publication. 3 For more detail, cf. Sänger (2010); Breytenbach (1996:99-112). 4 Cf. Pausanias 1.3.5; 10.3.4; Strabo 2.2.8 (146); 4.1.1 (176); 4.2.1 (189); 7.2.2 (293); Appian, Syria 32 (163); Iberia 1; Sib. Or. 3:509; 1 Macc 8:2; IK 15 no. 1558; IK 23 no. 75; IG 12,2 no. 516; MDAI(A) 37 (1912), 294 no. 20; SB 3 no. 7238. For abbreviations of epigraphic editions used in this essay, cf. the list of "Bibliographic Abbreviations" in Brill's New Pauly (http://referenceworks.brillonline.com/entries/brill-s-new-pauly/bibliographic-abbreviations-Bibliographic_Abbreviations). 5 E.g., in Caria (I8 no. 275), the Troad (Pfuhl/Möbius no. 1213), Mysia (IK 18 no. 125), and Lycia (TA no. 251). 6 Cf. for Pisidia TAM 3 no. 246 (Termessos); SEG 2 no. 710 (Pednelissos); SEG 19 no. 840 (Pogla); for Lycaonia CIG nos. 3991 and 400 (both Iconium), MAMA 4 no. 197 (Apollonia), for Phrygia JRS 2 (1912), 253 no. 8). Cf. also Mitchell (1993:1:31-41, 57). 7 Cf. Mitchell (1993:1:53, 55, 57). I am indebted to Freeman (2001:23-77) for the names in the following list. 8 Cf. MAMA 7 no. 401 (Κοµιν α). 9 Cf. MAMA 7 no. 532 (Κονβατια ος). 10 Cf. SEG 1 no. 463 ('Επατόριξ). 11 Cf. MAMA 1 no. 93a (Καµµα). 12 Cf. JHS 22 (1902), 123 nos. 55 (Έβουρηνός) and 56 ([Έβ]ουρηνά). 13 Cf. ETAM 15 no. 207 (Κορτερίς). 14 Cf. ETAM 15 no. 232 (Ρηγεῖνος and Μεδούσας). 15 Cf. ETAM 15 no. 214 (Τρο ονδας). 16 Cf. ETAM 15 no. 361 (τρο ονδας). 17 Cf. SEG 34 no. 1400 (Κα[µ]µάνιον). 18 Cf. ETAM 15 no. 85 (Μουσιανός). 19 Cf. ETAM 15 no. 140 (Αὐρισ ός). 21 Cf. IK 61 no. 454 (Και ιλλία). 22 Cf. CIL 6 no. 31545 (Breytenbach 1996:180, facsimile); Mitchell (1993:2:7). 23 Cf. SEG 20 no. 302 (Breytenbach 1996:181-82, photo). 24 It is unlikely that a city bearing the king's name would not be under the important Phrygian cities mentioned by Josephus as one of the cities where Jews were settled (Antiquitates Judaicae 12.147-153). Antioch was on the border between Phyrgia and Pisidia. Acts 13:14 and 42 mention a synagogue. 25 The expression χώρα denotes either land or an administrative region of a city, or - like here - the territorium of the colony; cf. TAM 3 no. 2; also Mason (1974: s.v.) The soft hills between the natural triangle formed by the Sultan Daglari stretching diagonally from the east northwestwards, the Karakus Dagi from the west northeastwards and the Dedegöl Daglari in the south, shape the territory of ancient Antioch. It included an area of almost 1 400 km2, from modern Körküler in the northwest, Hüyüklü in the southwest, Gelendost (Dabenae) in the south-southwest to Sarkikaraağaç (Neapolis) in the south-southeast (cf. Levick 1967:44-45). 26 Cf. Mason (1974: s.v.). On the governance of the colony, cf. Levick (1967:79); Mitchell (1993:1:89-90). 27 For this sense of ἐ βάλλω, cf. Danker (2000: s.v.) The personal pronoun in τῶν όρίων αὐτῶν refers to back to τοὺς πρώτους τῆς πόλεως. The subject of ἐ έβαλον is thus those in charge of the colony. They had the power to expel from the territory. 28 Lystra's domain stretched in the west to the Erenler Daglari and in the south up to the banks of the Car§amba river (cf. Levick 1967:53-54). 29 Due to the topic under discussion in this essay, material published previously was abbreviated and restructured to fit the current argument in this updated version (cf. Breytenbach 2004:157-169). 30 On φρυγία as an adjective, cf. Horsley (1987:174). 31 It is thus unnecessary to explain why γαλατικήν χώραν lacks an article, pace Conzelmann (1972:97); cf. the discussion by Barrett (1998:766-68). 32 Cf. Lee (1970; 1975). Note the early critique on such a reading by Robertson (1931:632-33). 33 This latter reading seems to fit the general narrative strategy of the episode better. Paul and his company were directed towards Troas to reach Macedonia as quickly as possible (cf. Dibelius 1968:12, 69, 169). It is nowhere implied that Paul and his company spread the Gospel on this journey through the Phrygian and Galatian regions. Even Haenchen (1965:427) explicitly notes this, although his adherence to the North-Galatian hypothesis forces him to make an exception in the case of the Galatian region. Neither was there a deviation down the Lycus or Meander valleys into Asia, nor did they cross the Sündiken Daglari into Bithynia. The possible road led down the Tembris until Dorylaeum and then carried on to Troas (cf. French 1994:54). 34 This would exclude a journey into Galatia proper. 35 On this road, cf. Mitchell (1993:1:40-41). 36 Cf. French (1994). For detailed topographical maps of the Lycus and Meander valleys, see Talbert (2000:61 and 65). 37 It is not necessary to add Antioch ad Pisidiam (Yalvaç), but see Haenchen (1965:419); Schneider (1982:201, 202-04); Weiser (1985:402). 38 Here there must have been a synagogue; cf. MAMA 4 no. 90 (= Ameling 2004 no. 214). 39 Cf. Pesch (1986:101); Roloff (1981:241); Jervell (1998:416). 40 Judging Luke's motives, Schmithals (1982:147) comments that Paul is depicted to avoid the centers of later Christian heresy (cf., e.g., Marcion and 2 Tim. 1:15). 41 For cartographic overviews, cf. Bloedhorn et al. (1992:B VI 18); Mitchell (1993:2:42) and 52. From Acmonia there is evidence of a 1st century synagogue; cf. Ameling (2004 no. 168) (=MAMA 4 no. 264); Mitchell (1993:2:33-36). 42 Cf. Ameling (2004 no. 180) (=MAMA 4 no. 202); Mitchell (1993:2:35). 43 Previous summaries of the evidence by Schürer (1986:27-30), Trebilco (1991:85-103), Mitchell (1993:2:33-34), and Barclay (1996:259-281). Cf. also Ameling's introduction (2004:380-382), and the 3rd century inscription published by Ameling (2004: no. 179). 44 In Laodicea a Roman Iudex, Lucius Pedecaeus, registered the amount. In Apamea, a Roman, Sextius Caesius, weighed a little less than a hundred Roman pounds in the presence of the Praetor; cf. Cicero, Pro Flacco 28.67f. 45 For later (2nd-4th centuries C.E.) Jewish inscriptions from Laodicea, cf. Ameling (2004: nos. 212, 213). 46 Cf. Ameling (2004: nos. 189, 190, 192, 195, and 205-206 [2nd century C.E. ], 191 and 201-204 [2nd-3rd], 187, 196-200, and 207-209 [3rd], 188 [3rd-4th], 194 [4th]). The late evidence implies an established community, cf. also Eusebius, Historia ecclesiastica 4.27.1. 47 Here Philo, Legatio ad Gaium 315, mentions the assembly of the Jews. 48 For Magnesia, cf. Ign. Magn. 8:1; for Tralles, cf. Josephus, Antiquitates Judaicae 14.242; for Antiochia ad Meandrum, cf. MAMA 4 no. 202 (late 2nd century C.E.? ); for Laodicea ad Lycum, Hierapolis, and Colossae, cf. Huttner (2013). 49 Cf. Ramsay (1897:667-676); Schürer (1986:27-32); Trebilco (1991:58-103); Mitchell (1993:2:33-35). 50 For this argument, cf. Breytenbach (2004:163-164). 51 This section summarizes an argument developed by Breytenbach (2013). 52 The name Βαρνάβας is mentioned only once in Salamis, the eastern port of Cyprus. Cf. Pouilloux, Roesch and Marcillet-Jaubert (1987: no. 238C1); cf. also the mosaic from an early Byzantine church floor in Thrace (SEG 40 no. 887). On Barnabas, cf. Ohler (2003). 53 There is also 3rd century evidence on the road westwards. Cf. MAMA 7 no. 297 (Amorium); SEG 28 no. 1210 (Synnada).